Why is it that children from disadvantaged backgrounds find it so difficult – and often impossible – to achieve? Few questions are of such fundamental importance to the functioning of a fair and effective society than this one, yet the academic and political narratives that exist to explain the problem are fundamentally contradictory: some say the root of the problem lies in racial prejudice; others that the key factor is class; others again argue that we should look first at laziness, government's commitment to provide demotivating ‘safety nets,’ and to the appeal of easy money earned from a criminal lifestyle. 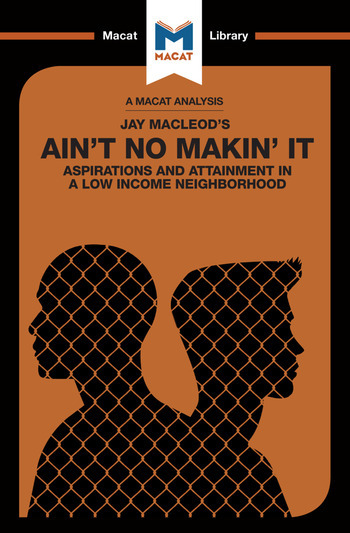 Jay Macleod's seminal work of anthropology is one of the most influential studies to address this issue, and – in suggesting that problems of class, above all, help to fuel continued social inequality, Macleod is engaging in an important piece of problem-solving. He asks the right questions, basing his study on two different working class subcultures, one white and largely devoid of aspiration and the other black and much more ambitious and conformist. By showing that the members of both groups find it equally hard to achieve their dreams – that there really ‘Ain't no makin' it,’ as his title proposes – Macleod issues a direct challenge to the ideology of the American Dream, and by extension to the social contract that underpinned American society and politics for the duration of the twentieth century. His work – robustly structured and well-reasoned – is now frequently studied in universities, and it offers a sharp corrective to those who insist that the poor could control their own destinies if they choose to do so. Dr Anna Seiferle-Valencia holds a PhD in anthropology from Harvard. She was formerly curator of Latin American Art at the Tuscon Museum of Art, Arizona.